First Lady Michelle Obama on Sunday encouraged kids to be more like their puppies in order to achieve a healthy lifestyle. Mrs. Obama drew some criticism for politicizing the annual "puppy bowl" when she made an appearance with White House dogs Sunny and Bo, using the platform to tell children that puppies drink a lot of water, so they should, too. "In order to prepare for the Bowl, Bo, Sunny, and local Puppy DC students encouraged the pups to keep moving as they practiced tire and tackle drills and played fetch with them," Let’s Move! said in a blog post. "The First Lady reminded everyone that playing with your pet is a great way to get active," the initiative said. "She even joined in for a touchdown dance to celebrate with the students and puppies." "This year's pups showed us that getting active and lapping up plenty of water are important ways to keep our bodies healthy and energized," Mrs. Obama said. "And as our family has seen with Bo and Sunny, going outside to walk and play with your pet is a perfect way to get moving and have some fun every day." Some Twitter users were not amused with Mrs. Obama’s appearance. 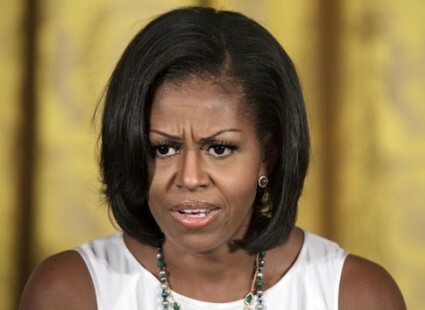 One user opined, "Michelle Obama your anti fat propaganda is not welcome in my puppy bowl!!!" "Michelle Obama uses the puppy bowl as an ad for her get healthy movement," said another. "Now another great American tradition is ruined. #ThanksObama"
Experts have said Mrs. Obama’s campaign to get Americans to drink one more glass of water per day is based on faulty science.